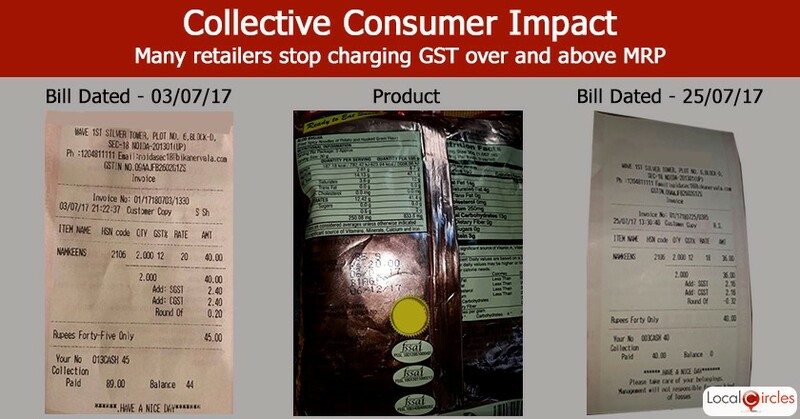 July 26, 2017, New Delhi: A few weeks back, a LocalCircles’ survey reported that 51 pct consumers had experienced many retailers charging GST on MRP, which was an illegal practice. Several consumers had posted pictures of receipts on LocalCircles and the same went viral on social media and was brought to the attention of Department of Consumer Affairs which immediately came into action. MRP is the highest price at which a product can be sold and is inclusive of all taxes. After consumer reports, officials from Legal Metrology Division and State Legal Metrology teams conducted surprise visits across India including those whose receipts were published by consumers on LocalCircles. For example: consumers who visited a popular food joint in Noida (receipts below) pointed out how they were charging GST on top of the MRP. Some of the consumers have reported today that this food joint has now corrected its billing system and is not charging GST on MRP of products anymore. A consumer bought 2 packets of packaged snacks with an MRP of Rs. 20 each and was charged Rs. 40. Earlier, a consumer was charged Rs. 45 for the same product. A copy of both the bills is attached. In a parallel issue, consumers also reported that many brands and businesses are following the practice of charging GST on the discounted price and also uploaded photos of their bills as a proof. Given the sheer number of cases, LocalCircles decided to investigate the issue in more detail. 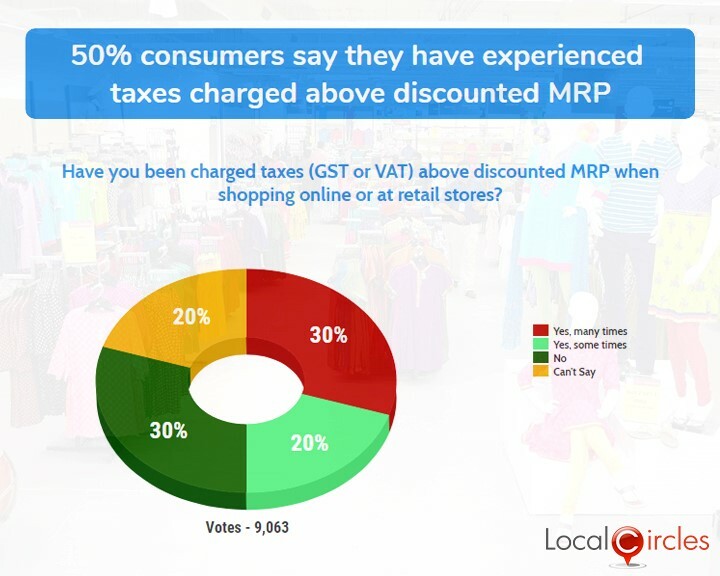 In a poll conducted by LocalCircles, 20% consumers said that they were charged GST on top of the discounted price. The investigation also reveals that many retailers are advertising discounts of a certain percentage to the MRP which is always inclusive of all taxes and when billings are adding the GST on top of the discounted price. By following this practice, if the discount is more than the GST percent, they are not violating packaged commodity rule 2011. Retailers however may want to soon rectify this practice because according to a judgement issued in Feb 2017 by National Consumer Disputes Redressal Commission (NCDRC) via revision petition no. 3156 of 2016, tax (at that time VAT) charged on a discounted price amounts to an unfair trade practice and since the decision hasn’t been appealed against, it stands in case of GST as well. This means that charging GST on discounted prices is also an unfair trade practice. 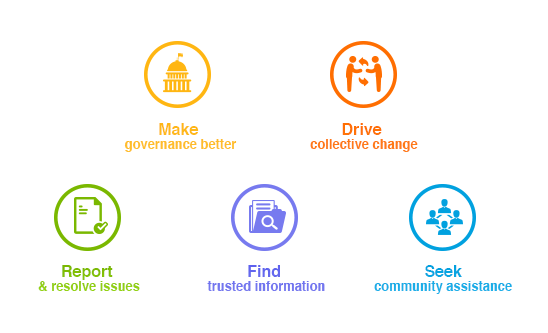 LocalCircles has shared these findings with key stakeholders in the Government requesting a notification be issued by the Government to address the issue. Solutions include an advisory classifying the same an unfair trade practice as outlined by the NCDRC and/or the GST council defining whether the GST should be levied on published MRP. If that is implemented, it will also reduce the practice of inflated MRPs where the average selling price is much lower than the published MRP.